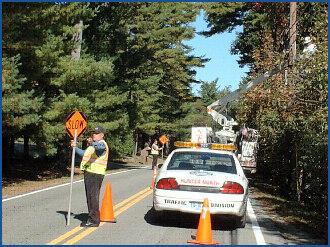 Safety and dependable flow are serious challenges and concerns in within circumstances needing temporary traffic control, such as road construction, special events or numerous other situations. Hunter North Associates ensures the safe, proficient movement of road travelers, safety of workforce, and traffic incident responders in road construction zones. Hunter North Associates believes in key fundamentals for worker safety and plan management. Our employees are trained to interact with motor vehicle traffic in a way that minimizes their susceptibility. Attention and the ability to act in response to irregular behaviors and circumstances are critical to the safety of travelers and employees. Particular attention is also given to ADA requirements and individuals with special needs that may be affected by the work zone. These plans identify local accesses in the work zone and how they will be taken into consideration. All plans guarantee that emergency vehicles have access. Employees who are exposed to moving roadway traffic or construction equipment are required to wear high-visibility apparel.